In this Christmas tale, which takes place in the Manhattan of 1949, Janet Leigh plays a widowed mother of a 6 year old boy. She is a comparison shopper for a major department store. When she buys and then returns a set of trains, as part of her job, just before Christams, she ignites a chain of events that involve not only her son, but her impending marriage to a well to do attorney, whom she does not really love. In addition, when Steve, played by Robert Mitchum, does not report her activities to his boss, he is fired. Finding himself homeless, and without any prospects, just in time for Christmas, he spends his last money, before leaving for the West Coast, to buy the trains for the boy. This causes some friction between the boy's mother and her fiancee, which threatens their relationship. The boy, knowing that Steve is broke, returns the trains in order to provide him with some money before he leaves New York. The fiancee senses the feelings that have arisen between Steve and his intended bride, and graciously backs off, but Steve is unwilling to claim the love which he has won. He feels that he has been battling not only the fiancee for her affections, but also the memory of her deceased husband, a battle he cannot hope to win unless she is willing to let go of the past. 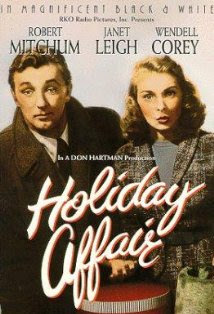 Robert Mitchum is in rare form in this romantic holiday film. Fans of Janet Leigh will be surprised at just how young she was in 1949, when this film was made. Yet within 5 years she would be one of the hottest "properties" in Hollywood, starring in several Alfred Hitchcock films, and married to Tony Curtis, a union which would give birth to actress Jamie Lee Curtis. With many uncredited character actors to round out the cast, smart direction and a witty script give this film the momentum it needs to push it through. The storyline is ably written and still applicable to today's relationships involving "non-traditional" families. A good holiday film on several levels, yet often forgotten amongst the myriad of films available at this time of year, I dust this one off each Christmas for inspiration.